My Top Five Pens…..For Right Now…. There were sev eral Chinese pens I considered for this list, but right now the Kaigelu comes up on top. 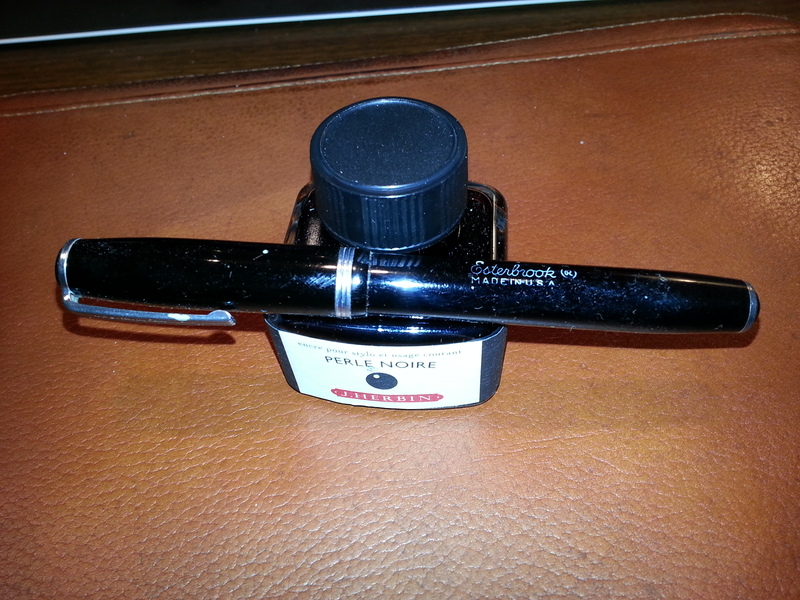 A copy of the modern Parker Duofold, it features a super smooth #6 size two-tone nib, that is very smooth and wet. One of the higher quality Chinese pens and one of the more expensive ones (for Chinese pens that is). You can find these from $18 to $30. But easilly comparible to $75+ pens. Pilot is a Ja panese company and produces a wide range of pens from economy (like the Metropolitan) to high end. Just my humble opinion, but I would label this pen as the finest economy penmoney can buy. It does have it’s faults, but they are mainly opinion based and not materially relevant (i.e. the fact that it takes a proprietary cartridge and converter instead of standard sized ones). I have two of these pens and based on them, I would pit the writing experience with their nibs (fine & medium) against ANY other pen. Easily the best fine point I’ve ever used. VERY high quality pen. For $15. You can’t beat it. My only vintage pen in my top 5. Which, if you knew me, is quite surprising. 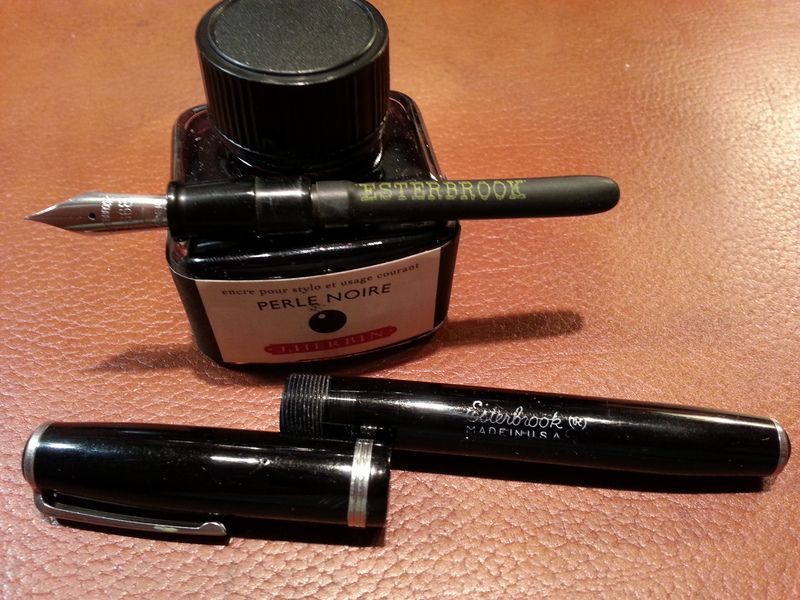 Esterbrook is probably my favorite of the vintage pen companies (followed closely by Sheaffer) for collecting. Their pens were/are beautiful, durable, and of high quality. This is a “Dollar” pen which preceeded the more common “J” pen. This has a 9668 nib. Smooth, firm writer. Dependable and beautiful. I picked up 3 Noodlers pens last year, an Ahab and two Konrads. The Ahab I was so-so about, but this Konrad was a different story. Piston fillers, they hold a lot of ink, and that’s needed. Because as they are flex nibs, these things DRINK the ink. I don’t really utilize the nib’s abilities too often in terms of coaxing a lot of line variation when I write. However, it’s still a superbly smooth writer for everyday work.. And cheap too at about $20. I only have 2 pens from “high end” companies, a Mont Blanc and a Pelikan. Both are the entry level pens for their companies, the MB 144 and this pen, the Pelikan M200. This is a FANTASTIC pen. The Mont Blanc…is not. My only quibble about this pen is the aesthetics of the nib. It’s a steel nib (and it’s awesome) with gold plate or electroplate. And it looks like electroplate. I have a lot of other far less expensive pens with plating, but they look like gold. Other than that, there is nothing I can say negative about this pen. Well, that’s my top five for now. Next month may be different. Let me know what yours are! This isn’t devoted to Esterbrooks. No, really I mean it. It’s not. But ……while snooping around eBay the other night, I came across this black estie about to end. I needed a black estie in the J size, so I sniped it. Black is easily my least favorite color in the Esterbrook line, but I needed a black one and this fit the bill perfectly. Cheap. What I found when I disassembled the pen is part of what I’ve come to love about these pens. They’re nearly indestructible. The sac was original and pristine. Absolutely pliable. I’m certainly not the most experienced pen guy out there – far from it. But this was the first time I’ve come across a pen that was probably 50 to 60 years old, with a sac that was perfect. I’ve bought other pens (actually, 1, a Sheaffer Sentinel) in the same sort of age range that was supposedly new/old stock. Never inked. But it’s sac had hardened and was useless. The next post WILL be about something other than Esterbrooks. I promise. I love the mail. Especially when a goody comes in it, addressed to me. Today was my latest eBay acquisition, a gray Esterbrook desk pen with a surf green ceramic base. Matches my hand-built (by me) Telecaster. Wicked Cool!!!!!!!!!!!!!!! Please forgive my pictures. I WANT to be a good photographer; in my mind, I AM a good photographer. And then I see the results and….well…….I’m not giving up my day job. The pen turned out nice. The nib was new to me, a 9556. Nice smooth fine nib. Author Will IsaacPosted on February 5, 2009 February 5, 2009 Categories Fountain PensTags Desk Pen, Esterbrook4 Comments on This Came in The Mail Today! Just a short note tonight on one of my favorite lines of pens, the Esterbrook. I have several, but today I broke out one that hasn’t been in the usual rotation for a year or so. And after inking it up, I’m not sure why. This particular example is a fern green SJ model (their short model) about 4 ¾” long. It’s outfitted with one of my favorite of the Esterbrook nibs, a 9668 which in their old advertisements was referred to as ‘general writing’. This pen is simply a work horse. It writes a buttery smooth, wet line, and I’ve inked it with another new favorite of mine, Lamy blue. The trick for me with these pens has been the nibs. As I mentioned earlier, this pen is fitted with a 9668 nib which is (again, my opinion) outstanding. However, In my collection, I’ve chosen to focus only on their 9xxxx series of nibs. Esterbrook made 1000, 2000, and 9000 series nibs. The 1000 and 2000 series used a folding method to tip the tines, while the 9000 series were tipped with iridium which I think, provides for a smoother writing nib, even in the finer points. I just haven’t found a 1xxx or 2xxx nib that wrote smoothly for me, though in all fairness, I haven’t sampled that many of them. Simply put, Esterbrooks are a fantastic line of pens! They are a great way for someone new to fountain pen collecting to be initiated into this wonderful hobby, as they are plentiful, and (at least at this point in time) are reasonably cheap to acquire. They offer the collector a VAST array of pens to collect, given the colors, sizes, styles and not the least of which, nib choices available. And while these pens were originally made for the ‘common man’ in terms of pricing, they offer quality to match just about anything else you’d want to compare them to. But don’t confuse quality with luxury. These pens were made with stainless steel hardware and nib material. Not gold. They were meant to be used. The advantage of using stainless steel was that when you acquire one today, they’re generally found in pretty good shape. No corrosion or brassing. Their bodies were made of a thick celluloid that typically cleans up nicely.